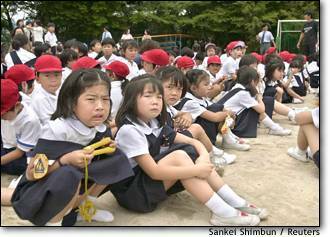 Schoolchildren weep on the grounds of Ikeda elementary school in Osaka prefecture, Japan, on Friday after fleeing from their classrooms. In the wake of the tragedy, NBC's Ned Colt discusses the shift of Japanese culture to a more tense country. OSAKA, Japan, June 9 — Japan was reeling Saturday after a schoolhouse attack in which eight children were slashed and killed by a man wielding a kitchen knife. Nearly two dozen people, including other children and their teachers, were wounded in the Friday attack, which struck deep at a nation traditionally known for its low crime and safe streets.